We’re dedicated to providing affordable, targeted marketing that helps your potential customers find your business online quickly and easily. 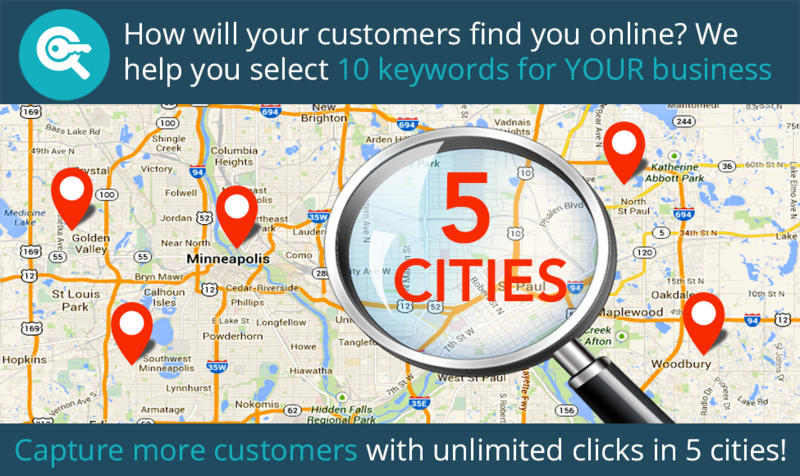 With 10 unique keywords spanning over 5 cities, your business will stand out where it matters most. Tell us about your key demographics and areas that you’d like to target and we’ll get your business listing found by more than just the city your business is located in.During your initial consultation with a member of our Provisioning Department, you’ll decide which keywords are best for your business. The goal is to select keywords that your potential customers are searching for in your geographic location.Need some help deciding which keywords work best? That’s what the experts at Internet Local Listings are for. Through years of working with over 90 different industries all across the United States and Canada, our database of keywords is enriched with all of the keywords and phrases that will get your business the most online visibility.After working with your Provisioning Representative to select five keywords, we will do a little more work on the back end to select five more keywords that offer your ten fully optimized keywords that will bring your business listing to the top of Google’s Search Pages when searched for.Want to be found in more cities? Check out our Visibility and Apex plans or add cities to your package starting at just $40 a city. Websites can be costly and quite time consuming when creating one from scratch but at Internet Local Listings, we know the importance of the role that a website plays for your business and that’s why we provide and use them for all of our clients.Not only is your website the first thing to represent your business when potential customers find you online, it’s also a great way to get the attention of different Search Engines through webpages that are enhanced with SEO from the inside out. What does this mean for you? This means that once you’re working with us for your internet marketing campaign, you’ll receive a Branded Website that is fully customized, created with your target audience in mind, rich in SEO content and hosted on our state of the art server that promises 24/7 uptime.Have your own website? Not a problem! Your Branded Website will link directly to your business site and give Search Engines an additional way to locate your business and place it on the front page – the more the merrier, right?With a library of over 90 industry specific templates, you’ll be sure to find one that best fits and represents your business. Videos are a great way to grab the attention of people browsing the internet. A thoroughly optimized 30 second video will display photos unique to your business and the keywords that you’ve chosen to target your audience accompanied by music that fits the rhythm of the video. These eye-catching videos will be displayed on your Branded Website and will offer another part of the multifaceted experience that your potential customers will find on the front page of Google and other Search Engines.Looking for a custom YouTube Channel to display your video on? Check out our Visibility or Apex Packages or ask about our a la carte options – available to completely customize your Digital Marketing Plan. Our client portal offers access to your ranking reports whenever you want to see them. By simply logging in, you can check on the status of your online listing whenever you feel like it – it even tracks the movement of your business listing through 100 pages of Google Search Results so you know where your listing is at and where it’s headed. With analytics about how your keywords are doing, how often your business listing is found in online searches and what pages your business can be found on from a day-to- day basis, we are able to provide services that are custom tailored to the success of your online marketing campaign.Have any questions about your client portal? No problem! Call or email us any time and we’ll be happy to walk you through everything you see.